Our product is the only legitimate, patented professional-grade do it yourself water transfer printing kit. The materials in our kits are designed specifically for the professional hydro-dipping process by individuals with extensive experience. For your convenience, we have combined the same professional grade materials in an at home do it yourself kit. Each kit comes with everything you need to process parts at home, including thorough written instructions. We spent over a year in research to provide a high quality clear coat with a hardening agent that cures over time - this means your dipped product will be resistant to the elements to fading and chipping for years to come. Plus, we carry over 200 patterns. If you cannot find what you are looking for please contact us. Nothing is more important to us than your satisfaction. MyDipKitStore's technical support speaks for itself. So trust that when you order from MyDipKitStore you are getting the best of what the market has to offer, not an impostor. 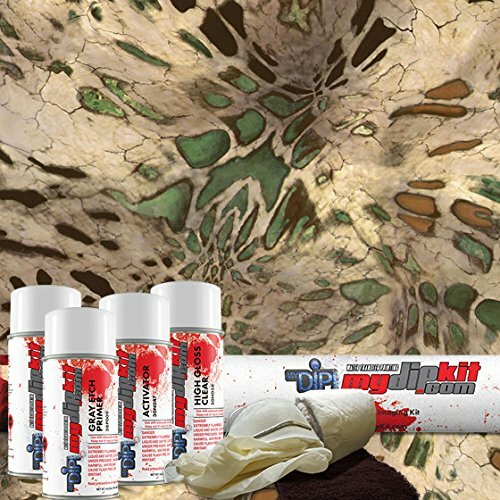 MyDipkitStore provides the original, patented do-it-yourself version of the commercial process used to transfer patterns or images onto any hard surfaced part that can safely be submerged in water. Each kit from MyDipKitStore comes with THE HIGHEST QUALITY film (20 inches wide by 6.6 feet) and absolutely everything else necessary to process your parts (minus the actual dipping container and a small amount of hot water). The activator, primer, gloves, scuff pad, a respirator, and a specially designed pre-mixed aerosol base coat paint and high quality clear coat you need are included. Each kit from MyDipKitStore also contains detailed instructions written by experienced processors with a combined 50 years in the industry. We provide technical support if necessary. These kits are direct from the original manufacturer so you can be sure that all kit components are of the highest quality!